Metamorphose Short Sleeve Ribbon Blouse: There are four removable bows, two on the sleeves, two on the center of the bust. The ribbons on the stomach can be untied. 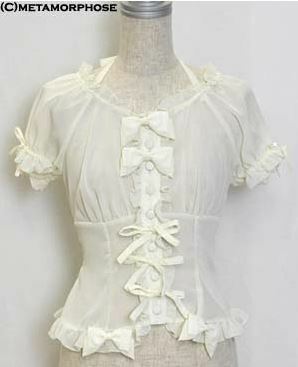 The neck ties are also removable, and the back has shirring with corset lacing. There are some marks on the ties and on the inside of the sleeves' elastic (see photos), but I think the condition is Good.